No parent is ever fully prepared to receive unexpected news about his or her child, whether that news is as innocuous as a scraped knee or as emotionally charged as an autism diagnosis. What is the proper reaction to have when it becomes clear that the path we imagined for a child is not the path they will ultimately walk due to a learning disorder, the autism spectrum, a behavioral or psychological issue, or a medical problem? 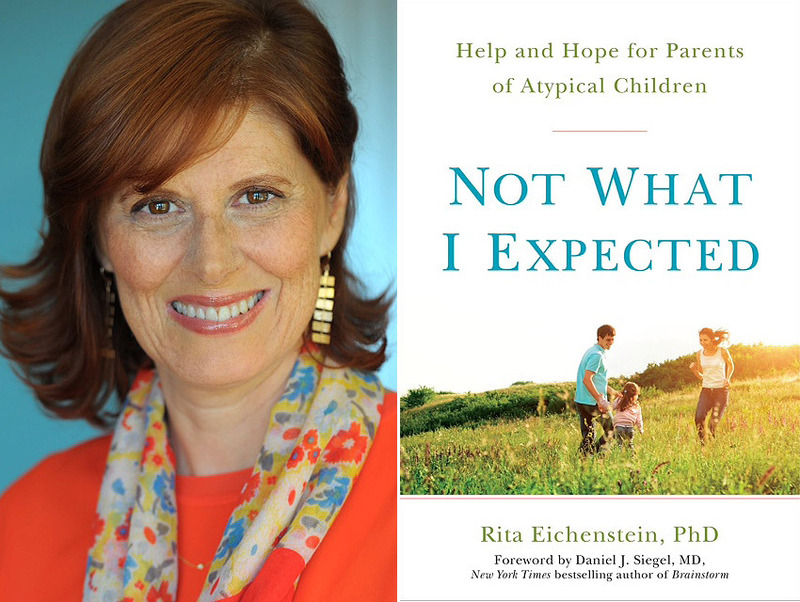 It is that question—along with the emotional havoc it can wreak—that Los Angeles-based neuropsychologist Dr. Rita Eichenstein seeks to address in her new book, Not What I Expected: Help and Hope for Parents of Atypical Children (Perigee Books, April 7). With more than 20 years of experience working with atypical children, teens, young adults, and their families, Eichenstein approaches what is undeniably a delicate subject with both experience and compassion. We caught up with Eichenstein to discuss high stakes child rearing, self-awareness among parents, and addressing both sides of the “atypical” equation. What made you write a book addressing the parents of atypical children? Parents are the hidden and completely under-served segment of the population. For every atypical child there are one or two parents struggling with significant emotional challenges. The unique mindset and emotional journey of parents is poorly understood. It is not taught in psychology school, nor do professionals who work with children get training in how to understand parents. After so many years of doing this work, I came to realize that only working with the child is ignoring half of the ‘atypical’ system. If the parents’ feelings and ability to cope with their new reality is not considered, which is the case in most child-oriented clinical situations, there is less chance that the child will get what he or she needs. What we know for sure is that mental state of the parent sets the tone for healthy or unhealthy parenting and affects the child’s ability to form loving attachments. Why is it important for parents of atypical children to “let go” of the image of the “ideal” child? We live in an atmosphere of ‘high stakes’ child rearing. The common perception is that your child has to be not only good looking and brilliant but well rounded in sports, arts, and all academic subjects; be popular, organized, and have plans to launch their own industry by a tender age. Parents anxiously look for signs that their child is OK by comparing to others: who is crawling first? Who is talking first? Who is reading Harry Potter first? And yet, children are incredibly diverse. No one is perfect, and no one could possibly be all of the things that we imagine our future child will become. It’s a loss, the image of that perfect child. In order to gracefully accept that loss, one must let go and get to know your very real and imperfect child. One out of six children will encounter some type of atypical challenge as they develop. And we need to be prepared for that reality and embrace the challenge wholeheartedly. You tell parents that your goal is to figure out how to help them raise “a happy and successful twenty-five-year-old.” Can you elaborate? Many parents who consult with me about their child are exceptionally anxious, which is natural when their child is struggling. They worry, will my child be OK? How will this affect their self esteem? Will they go to college? Will they be self-supporting? The benchmarks they tend to use that trigger this anxiety are often developmental detours when the child is young, such as poor handwriting, weak executive function, slow to learn how to read, or difficult social skills. I reassure parents that with proper identification, support and interventions, most children grow up to become successful adults, no matter what the range of diagnoses are currently. This world needs all types of minds. So many of our innovators, entrepreneurs, and movers and shakers were once upon a time atypical children. Having an atypical child triggers emotions ranging from fear and isolation to depression, disappointment, and even grief. What should parents do to take care of themselves? Yes, the [feelings of] isolation and anxiety that accompany raising a child who is atypical are important to understand. Parents need to first understand what ‘phase’ they are in—in the book, I discuss denial, anger, depression, bargaining, and acceptance on top of the chronic feelings of anxiety, loss, and isolation. I discuss developing a self-care menu, choosing carefully how to nourish yourself and continue to grow as a human being, not just as Timmy’s mother. Many people think that dealing with the day-to-day impact of having an atypical child can impact a family negatively, but I have discussed in the book so many examples of parents who have grown and thrived from the experience having an atypical child, and I discuss ways to bring an enhanced self awareness into the family system that affects personal growth of the parent. What would you like educators, extended family, friends and parents of “typical” children to know about the journey families with “atypical” children are on? To have an atypical child is a unique experience and it is often isolating. Reach out, ask parents how you can help. Parents often need a non-judgmental friend to talk to, or a babysitter, or a meal cooked for them. Go out of your way to do something nice for a family with an atypical child. Make sure that child is included in birthday parties. Invite the family over. Educate your children that diversity is a valued part of our society. To be absolutely typical is rare indeed. Dr. Eichenstein will be signing copies of her book on Wednesday, April 22 at Barnes and Noble at The Grove.